I received recently an appeal to sign a petition for a grant from the state for Speed Radar signs in our village. I declined, saying that a grant would be too costly for us. An explanation of my statement is in order. Transfer of wealth (goods or money) by the government to a person or political entity is an act of redistribution. After summation of all such acts, the result is a transfer from a part of the people or communities to the other part. If we represent the resources (income) of all such entities, we obtain a distribution, illustrated here by curve A in the figure. Redistribution results in a flatter curve, B, by transferring resources from entities on the right of point X, to those on the left. The total resources (wealth) stay constant: the areas between curves A and B on the right side and left side of X are equal. Redistribution affects curve A, because people just to the right side of X find it advantageous to reduce their resources (work less) and convert from givers to receivers. The loss of income is fully compensated by the reduction in effort. This alteration reduces the area under curve A (total wealth produced). This consequence is general: Any redistribution of wealth from a part of a society to the other part, results in a decrease of the total wealth produced by the society. There are other consequences as well. Thus, in the process of redistribution, the beneficiaries receive only a part of the wealth taken from the givers, because the transfer itself has a cost. This is shown in the figure by curve C. What the receivers get is represented by the area between curves C and A. The area between curves B and C (hatched) is the wealth used by the transfer itself. Among other things, it assures the livelihood of those that govern the transfer (politicians) and those who implement it (government employees). The hatched area increases with the total value transferred (area between A and B). Also, the natural and healthy tendency of men to better themselves makes the politicians and the government employees strive to increase the hatched area. For that, the latter return part of their take to the former as kickbacks. (They form unions and finance election campaigns.) When a politician acts against the trend and works toward decreasing the hatched area, he can be called a statesman. As it always happens when someone else’s money is handled, the hatched area is increased by waste, inefficiency and theft. The situation is more complex, because there are some taxes (mostly indirect) that are paid by all, to the extreme left of curve A, and also some expenditures that are made for the collective benefit of all, and cannot be apportioned to individuals. Such are the expenditures for national defense and law enforcement. Some people try to lump in there the payments for education and health care, but that is theoretically incorrect, because the beneficiaries of those services are individuals. For maximum efficiency (reduction of the hatched area), those services should be paid directly by the beneficiaries, to the maximum extent practically possible. The corrections to the curves for those collections and expenditures do not change in any way our analysis. 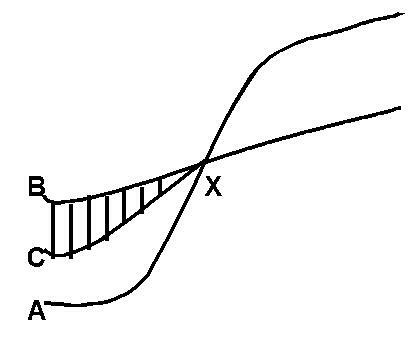 Through the merits of others than myself, our community is situated above the midpoint between X and the top end of curve A. That our petition will result in the creation of a spike on curve B just at our position is quite improbable. Because all the allocations are the result of negotiations and compromises involving those who control the process, a grant to such a community is obtained only after all the communities represented by points at its left are at least similarly rewarded. Considering the increase in the hatched area by that action, we should expect an added assessment, by an amount greater than the grant received. Rather than request a widget from the government, we should pay for it directly or, if we determine that we cannot, live without it. As a positive contribution to the country, of which we are a part, we should then try to convince other communities and the politicians (trying to reach especially those that are statesmen) to live likewise without the widgets.